Performance products drive innovation and consumer enthusiasm, guaranteeing the continued health and growth of every business in the distribution chain, from manufacturers to retailers and marketers to media. And because clean-air regulations govern so much of the manufacturing, sale and use of products in this category, SEMA has long emphasized the need for emissions compliance on the part of its member manufacturers while simultaneously striving to protect them from overly burdensome regulation. As you read this, thousands of automotive specialty-equipment manufacturers are working in full-frenzy mode, finalizing their latest automotive innovations for the 2016 SEMA Show. For 50 years now, the basic premise of the Show has remained unchanged: unite automotive specialty-equipment buyers with parts manufacturers for a four-day marketplace to grow sales and the industry. And yet the SEMA Show is also ever-changing, introducing new ways to make this marketplace more productive, informative and interesting. On July 8, 2016, SEMA members joined with car clubs, businesses and thousands of enthusiasts to celebrate the seventh annual Collector Car Appreciation Day (CCAD). A wide range of events was held in the United States and Canada to commemorate the day. The celebration was designated by SEMA-requested U.S. Senate Resolution 507, which was sponsored by U.S. Senators Richard Burr (R-NC) and Jon Tester (D-MT). It’s countdown time for the 2016 SEMA Show, to be held November 1–4 in Las Vegas—which means that it’s time to assess your preparations for the Show as an exhibitor. Have you done everything you can to ensure success by attracting buyers to your booth? 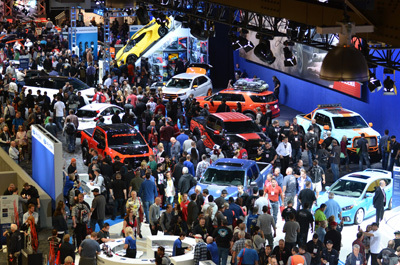 According to SEMA Vice President of Communications and Events Peter MacGillivray, more than 60,000 buyers are anticipated at this year’s SEMA Show, and an extremely large number of them are already deciding which exhibitors they want to see. With the 2016 SEMA Show just around the corner and plans already in the works for 2018, Trade Shows Director Tom Gattuso is always three steps ahead of the game when it comes to coordinating America’s largest annual gathering of small businesses. He has produced automotive events for 22 years—five of them with SEMA. He recently took some time to talk about what to expect and how to plan for the 2016 SEMA Show. We’ve come a long way since that frigid February night in Iowa when Republicans and Democrats gathered at churches and in school gymnasiums to cast the first votes in this year’s presidential election. What started with more than a dozen candidates has been narrowed to two: businessman Donald Trump, the Republican, and former Secretary of State Hillary Clinton, the Democrat. With the finish line in sight, it’s time to make our voices heard. Industry news from SEMA-member companies, including ProMedia, Brake Parts Inc., BettsHD, Baer Brake Systems, West Coast Customs and more. SEMA’s Government Affairs Office has compiled four comprehensive guides for members that cover topics of federal standards and regulations in the areas of healthcare, intellectual property rights, auto parts and, most recently, the Bonneville Salt Flats. The biggest news is this prototype’s DEF tank for the diesel’s emissions system, which even has its own skidplate. The basis for tow trucks and other heavy hauling trucks, the Ram 4500 will get some cosmetic upgrades to fall in line with the latest Ram trucks. Dodge has released a number of Viper ACR special editors to commemorate the Viper’s last year of production, and this appears to feature a color scheme of matte black and stripes, different from other editions currently planned. Spy photographers bring further proof of a ’17 Ford F-150 with a turbodiesel engine destined for sale. These are shots of Bumblebee and Barricade from the upcoming Transformers film. Here’s a look at more vehicles from the upcoming Transformers film. Australia has a vibrant modified-car culture comprising three broad groups: pre-’49 street rods; post-’48 street machines, customs and musclecars up to the late ’70s; and later-model vehicles. The distinctions are important. Generally, the older the car, the more modifications are allowed. The culture is similar to that found in the United States, although the range and extent of modifications permitted is much more regulated and limited. And, of course, Australians drive on the other side of the road! Any business that is advertising on the web needs to ensure that the publishers it works with are actively engaged in combating a growing threat: web browsers that are tricked-up with ad-blocking software. Installed in seconds on popular web browsers such as Firefox and Chrome, ad blockers essentially strip out all of the advertising programmed to appear on a webpage, neutralizing any impressions a company is looking to make with its precious ad dollars. Attendee feedback consistently indicates that buyers’ top priority at the SEMA Show is to find new products. Each year, the New Products Showcase makes this goal achievable by gathering more than 3,000 new and featured products in one place. Located in the Skybridge between Central and South Halls of the Las Vegas Convention Center, the Showcase includes products from every section represented at the trade show. All registration data for 2016 points to a bigger and more innovative Show than ever before, making it even more important to include the New Products Showcase in your strategy for the week. Here’s a look at some of the products you’ll see there in November. Last year, the U.S. Environmental Protection Agency (EPA) issued a proposed rule in 2015 that would have prohibited the conversion of emissions-certified vehicles into race cars. Although the agency intends to withdraw the proposal, it continues to assert authority to regulate the modification of vehicles used for competition under the Clean Air Act, thereby leaving the racing industry, its businesses and enthusiasts in a state of uncertainty. In late September of 1955, the NHRA staged its first-ever National Championship Drag Races in Great Bend, Kansas. The first car to make a pass at this historic event was Art Chrisman’s Hemi-powered no. 25 dragster. That’s Art in the cockpit as dignitaries (including NHRA founder Wally Parks, at right) perform the event’s ribbon-cutting ceremony.